Unless you just stick to playing Super Nintendo ROMs on your laptop like I do, you know that video gaming isn't a cheap hobby. The system, the games, the peripherals, the downloadable content... it all adds up quickly. Take Grid 2: Mono Edition. It will put you out a whopping $190,000! You read that right: $190,000. For the price of a 2014 Aston Martin DB9, you can buy this... video game. Right now, you're probably thinking you aren't in the right tax bracket to play this one. It is Guinness World Records-certified as the world's most expensive commercially available video game. 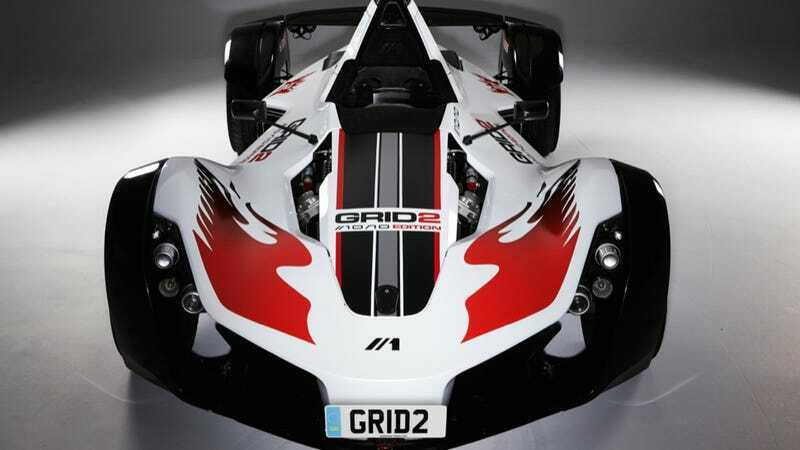 But Codemasters' Grid 2: Mono Edition may just be an outstanding deal, and here's why. They're only making one of them, and it comes with a race car, a racing suit and a helmet. The car in the photo above, a BAC Mono, is a British-made racer with 280 horsepower that weighs only 1,190 pounds. If you're the one lucky person who is selected after pre-ordering the game online, you get the Mono, a PlayStation 3, the game, a tour of the BAC factory, a Bell Racing helmet, and a racing suit with gloves and boots. All that for $190,000 actually sounds pretty sweet. But even if you don't get selected to win the prize package, you can still own Grid 2 when it goes on sale next week. Travis played it back in February, and he found it to be a solid competitor to the Forza series. Anyone willing to throw their hat in the ring for Grid 2: Mono Edition? It may just be worth it.